Pilots of the 361st Fighter Group gather together to give thanks for three days' leave (FRE 6186). With the conserved aircraft back inside, the glass wall of the American Air Museum has begun to go up. 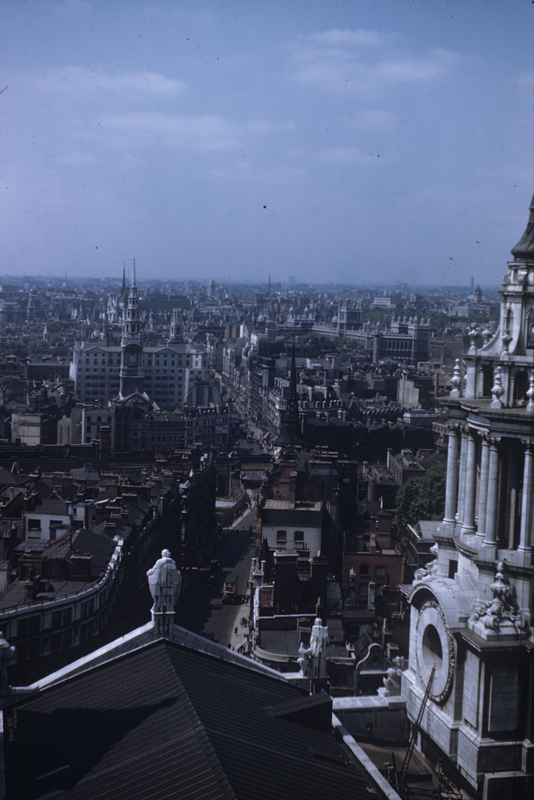 Robert Astrella of the 7th Photo Group took this shot from St Paul's Cathedral looking down Fleet Street during the Second World War (FRE 6935). The teachers will be walking along Fleet Street today as part of a London walking tour devised to take in sights American airmen might have seen when they were here 70 years ago. Participants in an Eighth in the East archaeology training day get to grips with the ambulance garage and mortuary building at Shipdham airfield, Norfolk. Guest post: Eighth in the East urge you to come along to IWM Duxford on 26 July to learn how to record and preserve your local airfield. Here’s an update on when the aircraft will be moving back into the American Air Museum if you were thinking of planning a visit to IWM Duxford to coincide with the movement of a particular aircraft. As part of the redevelopment project, the aircraft and vehicles were removed from the American Air Museum and relocated in other buildings on site in April and May. They are now being condition-checked and, where necessary, conserved before being re-displayed in the American Air Museum when it re-opens in Spring 2016. Students from Seattle's Northwest School performing 'Crates of Thunder' at Bethnal Green Academy, London. Although work on building the new website and preparations for this year’s Summer Residency for teachers have been keeping the American Air Museum team very busy of late, we were thrilled to be able to spend a day with students and teachers from Bethnal Green Academy in East London and The Northwest School in Seattle last week.